We manufacture many of our products right here in Avon, Ohio. 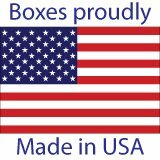 In fact, all of the boxes we sell are made in the U.S.A.! Thank you for buying quality American made products. We take great pride in supporting the American worker by paying fair wages and benefits and keeping our working environment safe. When you order products from Wildcat Wholesale you're sending a message that you support our American workers too. What other vendors do you buy from that can say they use American raw materials, to make American products, using American made machinery that is operated by American workers? Not many, we're sure. And, oh by the way, we do all this competitively with great American service and quality.